Tough loss for our guys last night as they had two chances to win the game, one at the end of regulation and one at the end of overtime. Comes down to the Celtics age-old question, is it OK to live and die by Pierce isolation as the clock winds down. It’s tough to keep giving it to Pierce on isolations if he is not healthy enough to get to his spot at the top of the key. Sooner or later the ball is going to end up in Rondo’s hand with him running maybe a pick and roll with Garnett or Bass and finding the open man. The stagnant offense is tough to look at end of games, especially since Doc is known as one of the games premier last second play coaches. Ray Allen again played great defense on Kobe, even though Kobe put up 27 points, Ray made him work for each bucket and the ones he had in the fourth didn’t come easy. The big Achilles of the Celtics all year has been giving up offensive rebounds to opposing teams. Last night the Celtics gave up 15 offensive rebounds with 7 to Bynum and 4 to Gasol, including two huge tip ins with 9 seconds left in regulation and then the game winning basket in overtime by Bynum. In the end it comes down to boxing out your man, something that’s taught from when you first start playing basketball. Gasol shouldn’t be able to snake his way in through four Celtics and get that tip. Celtics shot just 6-19 from 3 and only 39.2% from the field. Allen led the team in scoring with 22 points as he was 9-22 from the field. Pierce had another great night as he had 18-9-7 with a big three in OT to put the Celts up with two minutes left in OT. The Lakers shot 1-15 from three and only 39.6% from the field. Derek Fisher was extremely ineffective as he went 0-7 with 1 rebound and 2 assists. Avery Bradley did not see the court in a game where I was interested in how he would be able to guard Kobe. Celtics will look to bounce back today against the Raptors as the second part of their back to back. 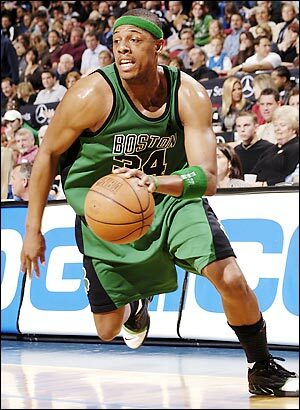 Extra notes: Shout out to Paul Pierce as he was named to the All Star team. On this day last year Ray Allen became the NBA all team leading three point shooter passing Reggie Miller. Rondo, Pierce, and Allen all played over 40 minutes. Greg Stiemsma, Jujuan Johnson, and Avery Bradley all received DNP’s.